The final year of this dying, decaying century will see the beatification of Padre Pio, the holy monk whom God sent as a sign for our age. For, while everyone wants to make us believe in a new “charismatic” Church, strangely we do not find there any wonderworking saints like the ones we meet throughout the Church’s history starting with Pentecost. Padre Pio seems to close the procession of their number, doing so magnificently, being the only priest to have born the stigmata of our Lord Jesus Christ. 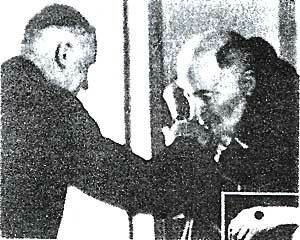 Much has been written about Padre Pio—more than 600 works, it seems—and the authors always stress the extraordinary side of his life: not only his particular chrisms (reading souls, healing, raising people from the dead, bilocating, ecstasies, exuding perfume, prophesying, etc. ), but. also the incredible sufferings which he endured from his earliest childhood, the persecutions undergone from some churchmen and even brothers in religion, as well as his two great charitable works: the founding of the House of Suffering, and prayer groups. I felt two forces clashing within me, tearing my heart: he world wanted me for itself, and God called me to a new life. It would be impossible to describe this martyrdom. The mere memory of the battle that took place within me freezes the very blood in my veins…. He was not yet 16 years old when he entered the novitiate. Above the door of the cloister, as a welcome, he read the sign: “Do penance or perish.” The daily rule of life included very many prayers, enough work, and little reading, being restricted especially to the study of the Rule and the Constitutions. I live in a perpetual night….I find myself troubled by everything, and I do not know if I act well or ill. I can see that it is not a scruple: but the doubt I feel about whether or not I am pleasing the Lord crushes me. And this anxiety recurs to me everywhere: at the altar, in the confessional, everywhere! Blasphemies cross my mind incessantly, and even more so false ideas, ideas of infidelity and unbelief. I feel my soul transfixed at every instant of my life, it kills me My faith is upheld only by a constant effort of my will against every kind of human persuasion. My faith is only the fruit of the continual efforts that I exact of myself. And all of this, Father, is not something that happens a few times a day, but it is continuous Father, how difficult it is to believe! To the souls he directed, he gave a five?point rule: weekly confession, daily communion and spiritual reading, examination of conscience each evening and, mental prayer twice a day. As for the recitation of the rosary, it is so necessary it goes without saying…..
Confession is the soul’s bath. You must go at least once a week. I do not want souls to stay away from confession more than a week. Even a clean an unoccupied room gathers dust; return after a week and you will see that it needs dusting again! The harm that comes to souls from the lack of reading holy books makes me shudder….What power spiritual reading has to lead to a change of course, and to make even worldly people enter into the way of perfection. If you do not succeed in meditating well, do not give up doing your duty. If the distractions are numerous, do not be discouraged; do the meditation of patience, and you will still profit. Decide upon the length of you meditation, and do not leave your place before finishing, even if you have to be crucified….Why do you worry so much because you do not know how to meditate as you would like? Meditation is a means of attaining God, but it is not a goal in itself. Meditation aims at the love of God and neighbour. Love God with all your soul without reserve, and love your neighbour as yourself, and you will have accomplished half of your meditation. Padre Pio, who was so affable and pleasant in his relations with people, could become severe and inflexible when the honour of Gad was at stake, especially in church. The whispering of the faithful would be authoritatively cut off by the Father, who would openly glare at anyone who failed to maintain a prayerful posture….If someone remained standing, even if it was because there were no places left in the pews, he would peremptorily invite him to kneel in order to participate worthily in the holy sacrifice of the Mass. Padre Pio, seated in his open confessional, all year round would ascertain that the women and girls who confessed to him were wearing skirts not too short. He would even cause tears to be shed when someone who had been waiting in line for hours would be turned away because of an offending hemline….Then some kind souls would step forward and offer help. In a corner, they would unsew the hem, or else lend the penitent a coat. Finally, sometimes the Father would allow the humiliated penitent to go to confession. One day his spiritual director reproached him for his harsh conduct. He replied: “I could obey you, but each time it is Jesus who tells me how I am to deal with people.” His severe manner, then, was inspired from above, uniquely for the honour of God and the salvation of souls. The same year, during the conciliar euphoria that was promising a new springtime to the Church, he confided to one of his spiritual sons: “In this time of darkness, let us pray. Let us do penance for the elect”; and especially for the one who has to be their shepherd here below. All his life, he immolated himself for the reigning pope, whose photograph was among the rare images that decorated his cell. 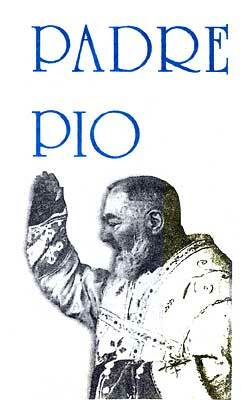 If we consider that Padre Pio was a veritable alter Christus, that his entire person, body and soul, was as perfectly conformed as possible to that of Jesus Christ, his stark refusal to accept the Novus Ordo and the aggiornamento should be for us a lesson to learn. It is also noteworthy that the good Lord desired to recall His faithful servant just before they were implacably imposed on the Church and the Capuchin Order. Noteworthy, too, is the fact that Katarina Tangari, one of Padre Pio’s most privileged spiritual daughters, so admirably supported the priests [of the Society of Saint Pius X] of Ecône until her death, one year after the episcopal consecrations of 1988. This should not surprise us, since the requests of our Lady of Fatima have not been listened to. He even told Mgr. Piccinelli, that the red flag will fly over the Vatican, “but that will pass.” Here again, his conclusion rejoins that of the Queen of Prophets: “But in the end, my Immaculate Heart will triumph.” The means by which this prophesy will come to pass, we know: by the. divine power; but it must be prompted by the two great powers in man’s hands: prayer and penance. This is the lesson which our Lady wanted. to remind us of at the beginning of this century: God wants to save the world by devotion to the Immaculate Heart of Mary’ and there is no problem. material or spiritual. national or international, that cannot be solved by the holy Rosary and our sacrifices.